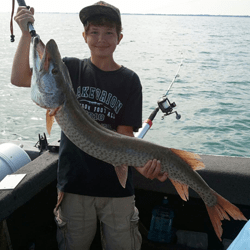 Lakeside Fishing Charters offer the best Walleye, Silver Bass, Musky and Perch and Bass fishing on Lake St Clair, the Detroit River and the St. Clair River. 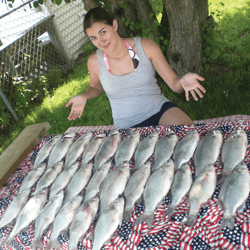 Walleye, Silver Bass, Musky, Perch and Bass Fishing on Lake St. Clair, Detroit and St. Clair Rivers. 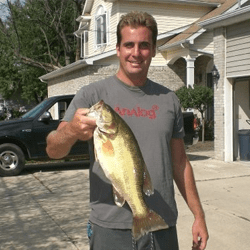 The best Walleye, Silver Bass, Musky and Perch and Bass fishing on Lake St Clair, the Detroit River and the St. Clair River. Book your Lakeside Fishing Charters Walleye, Silver Bass, Musky or Perch and Bass fishing trip TODAY. We offer full 10-hour days and half 6-hour days for Musky, and full 8-hour days and half 5-hour days for Walleye, Silver Bass, Perch and Bass. 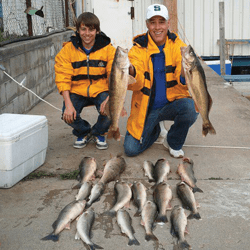 Lakeside Fishing Charters now offers Lake Michigan Salmon Fishing charters for King Salmon, Coho Salmon, Steelhead, Lake Trout and Brown Trout. Give Captain Kris Davis a call to book your Salmon fishing trip TODAY. We provide all of the equipment you will need for fishing, along with water and sun block. You provide your food and beverages (beer is ok). Lakeside Fishing Charters is a US Coast Guard licensed and inspected member of the Michigan Charter Boats Association. The MCBA and the individual members are dedicated to establishing a professional charter industry in the State of Michigan. To book your next charter fishing trip, call Lakeside Fishing Charters, Captain Kris Davis at (586) 260-0010 or email lakesidecharters1@gmail.com.